The BSE Sensex closed 718.09 points, or 2.15%, up at 34,067.40, while the Nifty 50 ended 221.30 points, or 2.21%, higher at 10,251.30. 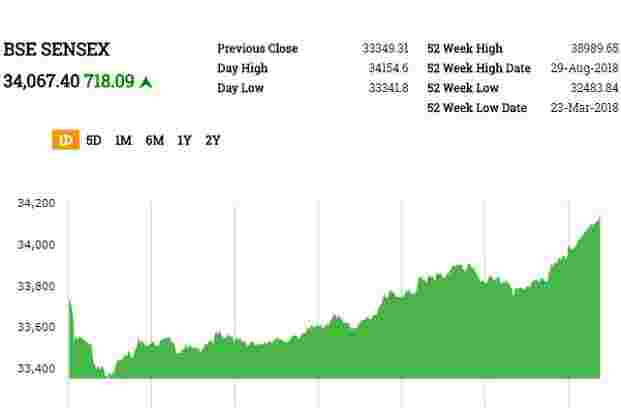 Intraday, the Sensex surged 805.29 points to 34,154.60 and the Nifty 50 gained 245.03 points to 10,275.30.The BSE MidCap and SmallCap indices jumped 2.80% and 2.06%, respectively. 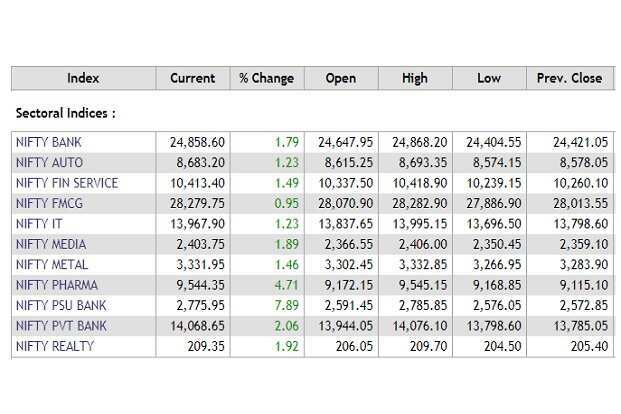 All the sectoral indices on BSE ended higher with healthcare rising most at 4.21%. 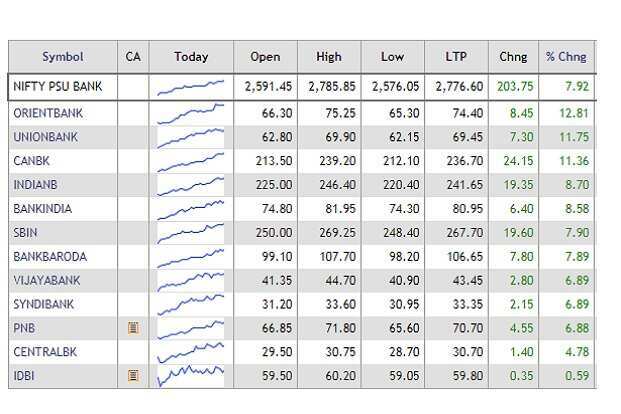 Energy, industrials, bankex, capital goods and realty rose over 3%.ICICI Bank, SBI, Adani Ports, Indiabulls Housing Finance and Dr Reddy’s Labs were among the top gainers on the key indices, whereas IndusInd Bank, HDFC Bank, Kotak Bank and Bharti Airtel were among the major losers. Monsanto India Ltd shares traded 3.66% up at Rs 2587. The company reported a profit of Rs 24.09 crore in the quarter ended September 30, compared to a profit of Rs 6.39 crore a year ago. Revenue from operations stood at Rs 128 crore in the September quarter from Rs 96 crore in the same quarter a year ago.Tata Power Co. Ltd reported a consolidated profit of Rs 393 crore in the quarter ended September 30 versus a profit of Rs 213 cror last year. Consolidated revenue from operations stood at Rs 7,333 crore in the September quarter, compared to Rs 6,874 crore in the same period last year. Shares rose over 13%. Century Textile and Industries Ltd shares rose 4.67% to Rs 808.30 per share. The company said its September-quarter net profit rose to Rs 157 crore versus Rs 52.78 crore last year. Sales rose to Rs 1,950 crore in the quarter ended September 30 compared to Rs 1,792 crore in the same period last year.Modison Metals Ltd shares gained 3.75% to Rs 47 per share. The company reported a profit of Rs 4.74 crore in the quarter ended September 30, up from Rs 3.71 crore in the year ago quarter. Revenue from operations rose to Rs 5.59 crore in the September quarter from Rs 4.82 crore in the same quarter last year. Moreover, the company said Rakesh Singh has resigned as CEO. The BSE Sensex rose 500.61 points, or 1.50%, to 33,849.92, while the Nifty 50 advanced 153.70 points, or 1.53%, to 10,183.70. The Nifty Bank index rose 1.79%. The BSE MidCap and SmallCap were up 2.35% and 1.51%, respectively. Prakash Industries Ltd shares rose 5.13% to Rs 106.50 after the company said its profit after tax rose to Rs 131 crore in the quarter ended September 30 from Rs 71.06 crore a year ago. Net revenue from operations came in at Rs 950 crore in the September quarter versus Rs 648 crore in the same period last year. Vijaya Bank shares surged as much as 9.35% to Rs 44.40 per share. The company reported a net profit of Rs 140 crore in the quarter ended September 30, compared to a profit of Rs 185 crore in the same quarter last year. Net interest income rose to Rs 3,634 crore in the September quarter from Rs 3,054 crore in the year-ago quarter. Provisions and contingencies stood at Rs 589 crore in the quarter versus Rs 458 crore last year. Provisions for NPA rose to Rs 488 crore from Rs 450 crore a year ago. Gross NPA came it at 5.86% versus 6.19% in the previous quarter. Net NPA was at 3.81% versus 4.10% in the previous quarter. Axis Bank shares rose as much as 7.2% to Rs 576.10 per share on BSE after the company on Friday said that it has signed an agreement to sell 1,979 ,900 equity shares it held in the National Securities Depository Ltd to HDFC Bank at a price of Rs 825 per share for a total amount of Rs 163.34 crore. Shares of Dr. Reddy’s Laboratories Ltd jumped as much as 6.43% to Rs 2,558.55 per share in their biggest daily percent gain since May 22. The company on Friday posted a 69.7% jump in second-quarter profit, helped by new product launches. Net profit rose to Rs 518 crore in the quarter ended 30 September, from Rs 305 crore a year earlier.Citi raised the target price to Rs 2,680 from Rs 2,270 with “neutral” rating, saying stability in U.S. pricing and cost control initiatives should provide a floor to base earnings.Nomura raised the TP to Rs 2704, maintaining “buy” rating. “Despite a decline in US sales (down USD30mn q-q), the company delivered a steady quarter, with a pick-up in sales in ex US markets and containment of costs. The results provide comfort on base earnings,” It said.Motilal Oswal revised the TP to Rs 2,300 from Rs 2,275 per share previously, while maintaining “Neutral” rating. “Delay in the resolution of regulatory issues and subsequent launches remains the key overhang,” said the brokerage.Prabhudas Lilladher increased the TP to Rs 2,170 and maintained “Reduce” rating. “With uncertain legal outcome of gSuboxone, channel consolidation in US and frequent regulatory interventions in India, DRRD has unfavourable risk-return ratio,” said the brokerage. “We expect high risk metrics continue to be drag over valuation in medium term.”Dolat Capital Market said, “We expect the major traction coming in FY20E. Suboxone hearing could still be a major surprise in the current fiscal, if the hearing is in the favour. With any delay in the product launch, there is a chance to miss on the benefits due to competition. On the other hand, biosimilar plans are expected to be on track.” 18 of 39 brokerages covering the stock rate it “buy” or higher, 11 “hold” and 10 “sell” or lower; their median TP is Rs 2,442, according to Refinitiv Eikon data. ICICI Bank shares surged as much as 8.58% to Rs 342.10 per share on BSE as many brokerages increased the stock’s target price after the bank’s Q2 earnings showed improvement in asset quality. Read moreJefferies said ICICI remains one of its preferred stocks as it expects continued core pre-provision operating profit (PPoP) growth over next 3-4 quarters as net interest margin starts expanding, loan growth picks up and asset quality normalises.Nomura raised TP to Rs 415 per share from Rs 375 and maintained “buy” rating, saying PPoP improvement could surprise positively. “We believe ROE (return on equity) recovery will be faster than earlier expected,” Nomura added.Emkay Global in a note to its investors said, “With a declining trend in fresh slippages after several quarters, we believe that the peak of NPA recognition cycle is over now, and the incremental additions to NPAs are expected to stay significantly lower than the previous years.” The brokerage has maintained its “buy” rating and increased its target price to Rs 404 a share.Antique Stock Broking Ltd said, “We believe ICICI Bank is in a strong position to leverage to its strong retail franchise and, with peak of stress recognition behind and credit cost normalization, RoA and RoE are likely to improve to 1.3% and 14% respectively by FY20.” The brokerage has maintained its buy rating and increased its target price to Rs 400, up 27% from current market price.Kotak Institutional Equities said, ““We are now seeing the commentary shifting gradually towards loan growth, NIM and importantly, decline in credit costs. As these trends are firmly visible, we believe that the RoE expansion has started to unfold, which would give greater confidence for valuation expansion.” The brokerage firm has maintained buy rating and increased its target price to Rs 410 a share from Rs 400.Prabhudas Lilladher Pvt. Ltd said, “We believe, recoveries/upgrades to slowly improve asset quality with quality coverage ratio, while should face limited risk on large slippage. Other metrics like CASA mix, fee growth and controlled opex remain positive but quality of loan book on granularity is yet to take place.” It has upgrade the stock to “Buy” with a revised TP of Rs 365.Of the analysts covering the stock, 49 have a “buy” rating on ICICI Bank shares, one has a “hold” and one “sell” rating, shows Bloomberg data. The BSE Sensex rose 191.94 points, or 0.58%, to 33,541.25, while the Nifty 50 added 58.70 points, or 0.59%, to 10,088.70. The BSE MidCap and SmallCap indices advanced 0.94% and 1.05%, respectively.All the sectoral indices on BSE gained with healthcare rising most at 2.41%. 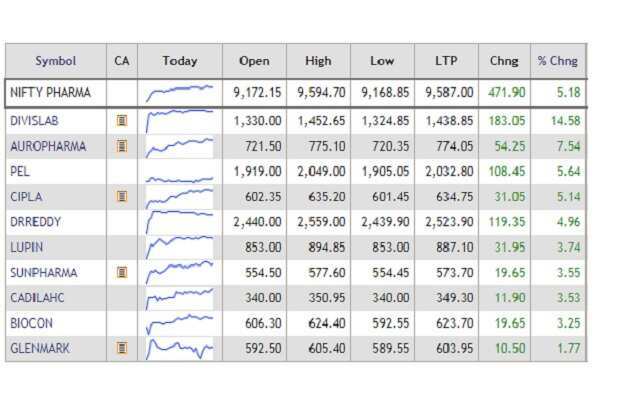 Bankex, capital goods, consumer durables, industrials and energy rose over 1%.ICICI Bank, Axis Bank, Dr. Reddy’s Labs, Sun Pharma, SBI and Tata Motors were among the top gainers on the key indices, whereas Kotak Bank, HDFC Bank, IndusInd Bank and Hindustan Unilever were among the major losers. Shares of Cox and Kings Ltd hit an upper circuit of 5% at Rs 192.25 per share after the company said it has entered into an agreement to sell its education business to Midlothian Capital Partners for all-cash enterprise value of Rs 4,387 crore. Shares of Granules India rose as much as 3.20% to Rs 95 per share after the company disclosed that the USFDA has completed an inspection at the company’s US unit, Granules Pharmaceuticals Inc., with two Form 483 observations. Shares of Divi’s Laboratories Ltd surged as much as 9.25% to Rs 1369.90 after the company reported a 92% jump in its net profit for the September quarter to Rs 398 crore, while revenue surged 44% to Rs 1285 crore.